One of my favorite things about the TV show “GLEE” is the mashups the kids do. In fact, the Super Bowl Sunday special episode mashing Thriller by Michael Jackson with another song “Heads Will Roll” which I had never even heard before was AWESOME. My musical outlet for the past three years has been handbells, and on Sunday we played the first mashup that I can recall since I have been with the group. We play during occasional Sunday services at Tibbetts United Methodist Church in West Seattle. We rehearse on Tuesdays at 7 PM and are looking for a couple more players, so if you are interested let me know! No experience necessary, not even reading sheet music (altho it helps). I am playing low bass this time, I am 2nd from the right in the back row, I look like I am looking down all the time but that’s because my music book was down on the table so I could have it closer to me because the table I was on was wider than I am accustomed to and I am waiting for my new glasses to come in. Don’t miss this “101” article on the best reasons to own a green home (new or green your current home) – save money and live healthier. Read The Top Four Benefits of Owning a Green Home by Green Real Estate Investing News. So have you ever wondered why a big building will have both a revolving door and a swinging door? 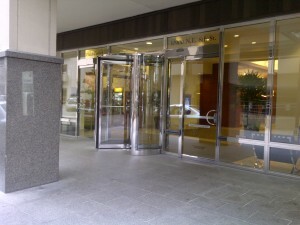 The revolving door is so that the building does not lose heat with the entry and exit of every visitor. The four doors of a revolving door keep most of the heat inside of the building. The right thing for you to do is to take the extra few seconds to push your way thru the revolving door rather than use the swinging door. The swinging door usually has a button to open it automatically to allow access in accorance with ADA regulations. Just think about trying to do it differently next time. And share this tidbit with a friend! Get 5 smart tips to save big on your game-day party–and share some of your own tips! Have fun watching the game with friends and family while supporting a good cause–and take a tax deduction, too. Celebrations.com has great party ideas, and you will find out how to throw a charity event at Home > Themes & Occasions > Charity Events on their website. Choose a charity or cause you love. Provide guests with suggested donations. For example, if you want to raise $500, recommend each person donate $25. Ask your local liquor store if it would donate a little free product in exchange for free promotion at your event. More often than not, the business is willing. HouseParty.com has a host of brands willing to provide free goods and services for your party, including DiGiorno Pizza and Kraft. Pick the brand you’d like to host and then complete a questionnaire about yourself and your knowledge of the brand. Your answers help the House Party team know if you’re a good fit for the promotion. If you’re chosen, the brand will supply a host of party goods for you and your friends to enjoy. Use real dishes. Save about $20 and space in a landfill by not buying plastic plates, cups, and silverware. Send Evites. Don’t send paper invitations. Use free electronic invitations instead. Recycle, donate, or sell your big, old TV. Use the big game as an excuse to treat yourself to a sleek, energy-efficient LCD TV. It’ll cost you up front, though you may find a pre-game day deal (see below) and you’ll save on energy in the long run. “Hypercook” it. A great way to save energy (and money) is to turn your oven off before your dish is finished cooking. You can also skip preheating or use a smaller cooker like a toaster oven to make some meals. Turn off bar room light displays. You may love your Coors Light neon sign but you don’t need it, especially when the game should be taking center stage. CouponMountain.com has deals on electronics, decorations, food, gear, and even tickets to the big game. And sites like Bargain Babe and Deal Seeking Mom also keep tabs on great sales. Safeway is also helping football fans prepare for Super Bowl parties with a host of party-themed recipes and coupons. Also nab that LCD TV for less on sites like overstock.com or catch Super Bowl season sales at stores like Best Buy or Sears. After all, it’s the company that really makes the party special. So rather than breaking your back (and the bank) trying to get everything done by yourself, include your guests and make it fun. Have a competitive potluck. Have a cook-off for fans of opposing teams (or let each person fend for themselves). It’ll add to the spirit of the day and save you big on groceries. Ask for help. Need extra chairs? Ask your friends to bring them instead of buying them. Looking for some preshow entertainment? Ask your friends to bring their favorite games to play. That’s what friends are for. Have any tips you want to share? Post a Comment! Unless there is some incentive to NOT do damage, contractors/developers/builders have a tendency to just run their massive machines everywhere and damage plant life in the area. In fact, the normal way of doing things seems to be to bulldoze EVERYthing and start with a blank slate and plant dinky little trees that take 20 years to actually benefit the area with size and shade. In this Built Green Certified Community in West Seattle preservation of old trees is REQUIRED. During phase on construction supposedly the protective fences had price tags hanging from them in the $100,000 range for each tree. If a builder damaged the tree or it died then they would have to pay that amount in restitution and penalty. To my knowledge nothing was actually damaged during phase one construction, although there was some tree removal two to three years later, which was unfortunate.